Chromobacterium violaceum is a bacterium commonly found in tropical and subtropical regions and is associated with important pharmacological and industrial attributes such as producing substances with therapeutic properties and synthesizing biodegradable polymers. Its genome was sequenced, however, approximately 40% of its genes still remain with unknown functions. Although C. violaceum is known by its versatile capacity of living in a wide range of environments, little is known on how it achieves such success. Here, we investigated the proteomic profile of C. violaceum cultivated in the absence and presence of high iron concentration, describing some proteins of unknown function that might play an important role in iron homeostasis, amongst others. Briefly, C. violaceum was cultivated in the absence and in the presence of 9mM of iron during four hours. Total proteins were identified by LC-MS and through the PatternLab pipeline. Our proteomic analysis indicates major changes in the energetic metabolism, and alterations in the synthesis of key transport and stress proteins. In addition, it may suggest the presence of a yet unidentified operon that could be related to oxidative stress, together with a set of other proteins with unknown function. The protein-protein interaction network also pinpointed the importance of energetic metabolism proteins to the acclimatation of C. violaceum in high concentration of iron. This is the first proteomic analysis of the opportunistic pathogen C. violaceum in the presence of high iron concentration. Our data allowed us to identify a yet undescribed operon that might have a role in oxidative stress defense. Our work provides new data that will contribute to understand how this bacterium achieve its capacity of surviving in harsh conditions as well as to open a way to explore the yet little availed biotechnological characteristics of this bacterium with the further exploring of the proteins of unknown function that we showed to be up-regulated in high iron concentration. Chromobacterium violaceum is a mobile bacillus, a facultatively aerobic and free-living organism that is associated with opportunistic infections in immunosuppressed individuals. Its ability to withstand various antibiotics poses this organism as responsible to a considerable number of deaths ,. Research on pharmaceutical applications of C. violaceum have been carried out since the 1970s with reported production of antitumor peptides, compounds with analgesic and antibiotic capability -, and synthesis of biodegradable polymers . C. violaceums hallmark is the production of the purple pigment violacein that has innumerous therapeutic properties such as anti-tumoral activity . Pharmacological and industrial attributes motivated the scientific community to sequence its approximately 4.7 Mbp genome . To date, approximately 40% of its ORFs remain with unknown functions which make this organism a target for prospecting genes with biotechnological properties. Previous reports have described several key aspects of C. violaceum, such as having great metabolic versatility presenting several ORFs related to osmotic stress, response to heat, oxidative stress, DNA repair, and a large number of proteins involved in iron metabolism ,. In general, microorganisms need iron to survive; it is essential in key biological processes such as cellular respiration, electron transfer, gene regulation, DNA synthesis , and is known to play key roles in metabolism of various pathogenic microorganisms -. Despite its importance in catalysis of biological processes, an excess of iron can damage cells through the Fenton reaction in which ferrous ions react with hydrogen peroxide and produce hydroxyl radical . Thus, high concentrations of this metal can lead to oxidative stress which causes damage to biomolecules and ultimately the death of the organism or cell . The aim of this study was to compare the proteomic profiles of C. violaceum cultivated in absence and presence of iron. Taken together, a further comprehension on the metabolism of this metal in pathogenic organisms can aid in the discovery of therapeutic targets and further understanding in the biology of its adaptation mechanisms. Briefly, our results showed an increased synthesis of proteins mainly related with the tricarboxylic acid cycle (TCA), transportation, oxidative stress, and lists key proteins possibly linked to its adaptation in an iron rich medium. In addition, under the light of proteomic and RT-PCR data, we identified a new non-characterized operon possibly related to oxidative stress, composed with sodB2 and two other genes of unknown function. Isolated colonies of Chromobacterium violaceum, ATCC 12472 strain, were inoculated in liquid Luria Bertani (LB) medium for 1618 hours at 28C and shaken at 200rpm. The treatment was performed in an Erlenmeyer flask diluting the pre-cultivated bacteria with liquid LB medium (1:10) in a final volume of 100mL. The FeSO4 solution was prepared at an initial concentration of 500mM and was further filtered with 0.22 μm GHP membrane disc filters [Acrodisc] and added at a final concentration of 9mM. This concentration was chosen after a screening of treatment concentrations in which at only 9mM of iron we observed different patterns of proteins synthesis at 1D-SDS-PAGE, in contrast to the negative control as well as previous results of our group that have demonstrated the high resistance of C. violaceum to iron (data not shown). The negative control consisted of C. violaceum grown in a LB broth. The treatment exposed the culture for four hours under the same conditions as described above. A measurement of C. violaceum growth was performed between 04 hours and the optical density was read at 600nm in a 96-well spectrophotometer. The negative control and the experimental conditions were performed in biological triplicate. Total intracellular iron concentration was estimated as described at Barbehenn et al. . First, C. violaceum cultures (100mL) were grown until reaching 0.40.5 OD when the treatment began. After the four-hour treatment, the samples were centrifuged at 4C, 2700g for 15min. Then, samples were washed with 50mM EDTA, followed by another wash with ultrapure water. Finally, the phenanthroline assay was performed as described by Barbehenn et al. . The negative control and the experimental condition were performed in biological triplicate. After four hours of treatment, the samples were centrifuged at 2880g and 4C for 20minutes. The supernatant of all samples (including negative control) were discarded and then the samples were washed in 50mM EDTA pH8.0 and centrifuged under the same conditions previously mentioned. Then the samples were washed once more in 10mM TrisHCl, pH8.5 solution and centrifuged at 2880g, 4C for 25minutes. Cells were lysed in a 300 μL 400 μL extraction buffer containing 7M urea, thiourea 1M, 50mM DTT, 0.5% CHAPS, and 30mM Tris pH8.5. Proteins were precipitated by adding 1mL of acetone, vortexing the samples and then centrifuging at 10,000g, 4C for 3minutes. This process was performed a second time, and the sample was centrifuged again for 5minutes. Finally, the proteins were solubilized in the same extraction buffer (300 μL 900 μL). In order to evaluate if the iron treatment promotes oxidative stress in Chromobacterium violaceum, antioxidant enzymes catalase (CAT) and superoxide dismutase (SOD) activities were measured on total protein extracts. Catalase Assay Kit 707002 and Superoxide Dismutase Assay Kit 706002 (Cayman Chemical, Ann Arbor, MI) were used according to manufacturers recommendations to quantify the catalase and superoxide dismutase activity level, respectively. The total antioxidant activity was evaluated using the Antioxidant Assay kit from Sigma-Aldrich (CS0790) according to manufacturers instructions. The protein concentration values were used to normalize the enzyme activity. The experiment was performed in biological triplicate. The total protein extracts were quantified by the Bradford method  and 20 μg of protein from each sample was resolved on a polyacrylamide gel under denaturing conditions (SDS-PAGE) at 12%. The marker used was the Precision Plus Proteins WesternC Standard from Bio-Rad. The gel was stained using the Coomassie Colloidal from Sigma-Aldrich. Following electrophoresis, each lane was excised in nine fragments according to the proteins density. All the proteins from each lane were excised and each group of proteins was analyzed independently by mass spectrometry (see below). Proteins were extracted and digested from these fragments as in accordance to the revised Shevchenko et al. protocol . The dye and the SDS were quickly removed by washing the fragments three times in 50% acetonitrile solution (ACN) and 10mM ammonium bicarbonate. Then the bands were dehydrated in ACN at 100%, reduced with 10mM dithiothreitol (DTT) at room temperature and alkylated with 50mM iodacetamide (IAA) in a dark environment. Then, the bands were washed again with 100mM ammonium bicarbonate, dehydrated with 100% ACN, and rehydrated with 100mM ammonium bicarbonate; this was done twice. The bands were then hydrated in a trypsin solution (Trypsin Gold, Mass Spectrometry Grade from Promega [v5280]) prepared according to manufacturers instructions. 3550 μL of trypsin at 20 μg/mL was added to the samples kept on ice. Then we added 50mM of ammonium bicarbonate, sufficient to cover the bands during incubation at 37C for 1618 hours. For peptide extraction, 1030 μL of 5% formic acid were added to the bands. After 10minutes of incubation at room temperature, the supernatant containing peptides was transferred to another tube. Then a second extraction solution (5% formic acid and 50% ACN) was added in enough volume to cover the bands. The supernatant was transferred to a previously prepared tube containing the already extracted peptides. The extraction of the peptides performed with the second solution was repeated once again. Finally, the solution containing the digested peptides was concentrated in Eppendorfs Concentrator Plus. After the in gel digestion, the samples were loaded onto the liquid chromatography NanoAcquity UPLC system (Waters) connected with an ESI-Q-Tof premier (Waters) mass spectrometer. The tryptic peptides from each sample (4.5 μL) were separated on a BEH130-C18 column (100 μm × 100 mm) at a 600 nL/min flow rate. The gradient varied from 2 to 98% ACN in 0.1% formic acid for 45minutes. The instruments data acquisition mode was set to a data dependent top three and controlled using MassLynx v.4.1. The ProLuCID search engine v 1.3  was used to compare experimental spectra against those theoretically generated from C. violaceum ATCC 12472 sequence downloaded from Uniprot in January 2013, plus those from 127 common contaminants to proteomic experiments (e.g., Keratin, BSA, etc.). The search was limited to tryptic and semi-tryptic peptide candidates; carbamidomethylation and oxidation of methionine were imposed as fixed and variable modifications, respectively. The search engine accepted peptide candidates within a 50-ppm tolerance from the measured precursor m/z and used the XCorr and Z-Score as the primary and secondary search engine scores, respectively. The validity of the Peptide Sequence Matches (PSMs) was assessed using the Search Engine Processor (SEPro) v.2.2.0.1 . Briefly, identifications were grouped by charge state (+2 and ≥ +3) and then by tryptic status (tryptic or semi-tryptic), resulting in four distinct subgroups. For each group, the XCorr, ZScore, DeltaCN, and DeltaMass values were used to generate a Bayesian discriminant function. The identifications were sorted in a non-decreasing order according to the discriminator score. A cutoff score was established to accept a false-discovery rate (FDR) of 1% based on the number of decoys. This procedure was independently performed on each data subset, resulting in a false-positive rate that was independent of tryptic status or charge state. Additionally, a minimum sequence length of six amino acid residues was required. Results were post processed to only accept PSMs with less than 10ppm and proteins supported by two or more independent evidences (e.g., identification of a peptide with different charge states, a modified and a non-modified version of the same peptide, or two different peptides). This last filter led to a 0% FDR in all search results for all our sample analyses. The PatternLabs updated ACFold module was employed to pinpoint differentially expressed proteins between the control and iron exposed condition ,. The revised ACFold module presents increased sensitivity under the Benjamini-Hochberg q-value  bound by applying a variable fold-change that varies with the AC-test p-value as a power law . Proteins uniquely identified in one condition (control or iron) were pinpointed according to PatternLabs Approximate Area Proportional Venn Diagram module. To better cope with the limitations from undersampling, we only considered proteins identified in two replicates of each condition, and not found in any replicates of the other condition. The functional categorization of the proteins was assessed using PatternLabs Gene Ontology Explorer (GOEx) module . Our data analysis used the gene ontology database (OBO v1.2 - http://www.geneontology.org/GO.format.obo-1_2.shtml), downloaded February 16th, 2013 and the C. violaceum gene ontology annotation in the Uniprot text file format of its protein sequences. The protein sequences were compared  against the protein database from NCBI for automatic annotation and functional domains were predicted using the Conserved Domain Database (CDD) . The structural prediction of hypothetical ORFs was performed using the server for protein homology detection HHpred (data not shown) . FASTA sequences from each hypothetical protein were submitted to the server and the PDB database from February 23rd of 2013 was used. No specific organism proteome was selected, the method for multiple sequence alignment (MSA) generation was HHblits , up to 3 MSA generation iterations was used, the secondary structure score was applied, and the alignment mode was set to local. The metasearch tool STITCH 3.1 (http://stitch.embl.de) was used to estimate protein-protein interaction networks related to iron response. STITCH is a tool used to explore known and predicted interactions between proteins, and chemical or physical agents. These agents interconnected by evidences derived from experiments, databases, and literature. One network was generated composed of proteins that were identified exclusively in the iron treatment or having an increased expression after being exposed to the metal. As the interaction targets were derived from experimental data, a high confidence index (0.700) was used to generate the networks. All prediction methods were activated: neighborhood, gene fusion, co-occurrence, co-expression, experiments, and databases text mining. The assembled network was exported to be subsequently analyzed in Cytoscape 2.8.2 and Cytoscape 3.0 . The former was used to calculate the centrality indexes and the later for the remaining analysis. The most relevant proteins sub-networks were selected using the Cytoscape MCODE v. 1.4.0 plugin (Molecular Complex Detection) . The MCODE analysis parameters were: loops inclusion; degree cutoff of 2; haircut option enabled (which leads to deletion of nodes cluster with a single connection); fluff option enabled, node score cutoff at 0.2; K-core at 2, and maximum depth of 100. The only clusters used were those in which the MCODE index score was greater or equal to 2.5. The network centrality calculations were computed from local networks and topologies. The networks bottlenecks were identified through a Betweenness vs. Node Degree chart with the values generated by the CestiScaPe 1.21 plugin installed at Cytoscape 2.8.2. Betweenness indicates the extent to which a particular node is among all other nodes in a network and usually shows the influence of this node on information propagation within the network ,. Node Degree corresponds to the number of connections that a particular node has with other adjacent nodes. High node degree levels are called hubs . Thus, a particular node with high node degree and betweenness values represents a bottleneck, or a protein that interconnects many biological processes . Isolated colonies of C. violaceum were cultured in absence and the presence (9mM) of iron in the previously mentioned conditions. Further, 2mL of the culture was used to extract and purify total RNA using the RNAspin Mini Isolation kit according to manufacturers instructions (GE, catalog number 25-0500-72). Once extracted, the total RNA was used to synthesize cDNA with random primers with the High capacity cDNA reverse transcriptase kit according to manufacturers instructions (Applied Biosystems, catalog number 4368814). The Reverse Transcriptase Polymerase Chain Reaction (RT-PCR) was used to validate the expression of the hypothesized operon as a unique transcript. As such, RT-PCR was performed to provide the transcript evidence of regions encompassing the ORFs CV_0869 (the first) and CV_0867 (the last). Primers for the above mentioned genes were designed using Primer 3 (v. 0.4.0) software. RT-PCR was performed using AmpliTaq Gold 360 Master Mix (Catalog Number 4398881, Applied Biosystems). One microlitrer of cDNA was used and a final volume of 25 μL was used according to the manufacturers instructions. Then, the PCR steps were the following: initial denaturation at 98C for 5min, 40cycles of 98C for 30sec, 59.8C for 30sec, 72C for 90sec and a final extension at 72C for 7min were followed. Reactions using water and RNA instead of cDNA were carried out as negative controls. To verify the size of the amplicons, 5 μL of the PCR reaction was loaded on 1% agarose gel and submitted to electrophoresis. The DNA ladder of 1 Kb (Promega) was used as reference. An additional file (Additional file 1) shows the sequence of the primers used in this work. The quantitative real-time PCR was used to validate the proteome analysis by verifying the expression of the genes CV_0868 and CV_0867, both comprising what we hypothesized as a newly described operon. Seven nanograms of cDNA (produced as mentioned above, from the iron-culture and control) and a final concentration of 0.25 nM of each primer were applied in a 10 μL reaction using Power SYBR Green PCR Master Mix (Applied Biosystems, 4367659) in an One-Step cycling with the following conditions: 95C for 3min, 40cycles of denaturation at 95C for 3sec, annealing/extension at 60C for 15sec. The 16S rRNA was used as endogenous control and to normalize the expression of the other two genes. The relative quantification was assessed by ΔCt comparative analysis. The primers were designed using Primer 3 (v. 0.4.0). Primers sequences are described in Additional file 1. Statistical analysis was performed according to the t-test. Results were considered significant for p <0.05. Two biological replicates were used. The phenanthroline assay showed that the treatment is, as expected, leading to a significant increase in the total intracellular iron in C. violaceum (Figure1) when compared with the bacterium grown in the absence of the metal. The OD measurement (Additional file 2) showed that the iron treatment leads to a growth arrest in C. violaceum although, from this assay, we cannot see a death tendency caused by the experimental condition, suggesting that this bacterium has a mechanism to withstand this elevated iron exposure. Intracellular iron concentration of C. violaceum before and after the treatment. NC = Negative Control. We evaluated if the iron concentration used in the experiment can induce oxidative stress by assessing the catalase and superoxide dismutase enzymatic activities and the total antioxidant activity from the C. violaceum protein extract. 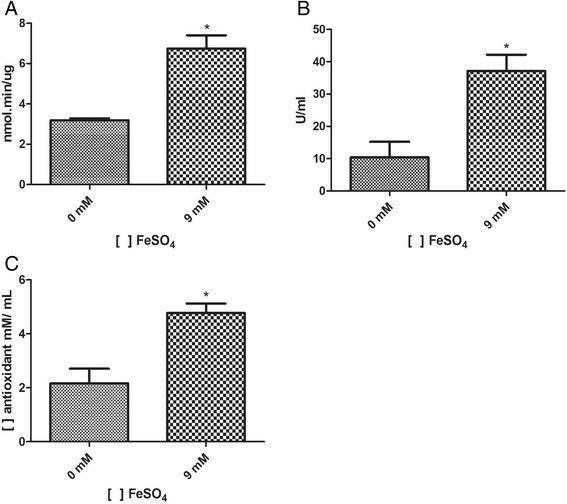 The catalase activity (Figure2A), the superoxide dismutase activity (Figure2B), and the total antioxidant activity (Figure2C) increased significantly during the treatment performed with 9mM iron, which suggests that the presence of metal is inducing an oxidative stress scenario in C. violaceum. Antioxidant profile of Chromobacterium violaceum . A) Catalase activity assay. B) Superoxide dismutase activity assay. C) Total antioxidant activity assay of the total proteic extract of Chromobacterium violaceum. PatternLabs analysis allowed us to identify 230 proteins found in at least two biological replicates and in both biological conditions of which 28 were only identified in the control and 9 in the iron-responsive proteome. We note that identifying a protein exclusively in a condition does not exclude the hypothesis that it is present in the other condition; it can be below the detection sensitivity or not identified given the random sampling nature and undersampling of our data acquisition strategy. Nevertheless, for the experimental design at hand, identifying proteins on a single condition for two technical replicates suggests a differential expression . The differentially expressed proteins found in the Control versus Iron treatment were accessed according to the updated ACFold module; 45 proteins were pointed as differentially expressed (Blue dots in Additional file 3) (q <0.05). Table1 lists the differentially expressed proteins while the Additional files 4 and 5 list the proteins identified only in the iron-responsive proteome or control condition, respectively. All the proteins listed below has a q value <0.05. The PatternLabs Gene Ontology Explorer module shows the most representative class of proteins according to the Gene Ontology classification. 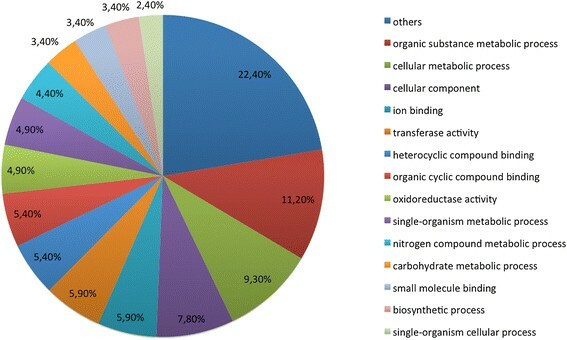 As can be noted in Figure3, the majority of the proteins were mapped was the Organic substance metabolic process (11.2%) GO term which includes proteins belonging to many different biological processes. Other worth-mentionig categories are: transferase activity (5.9%), ion binding (5.9%), and oxireductase activity (4.9%). For the sake of completeness, we used more specific classifications retrieved from Uniprot server to describe each class of proteins in the tables. Pie chart distribution of the Gene Ontology category analysis. 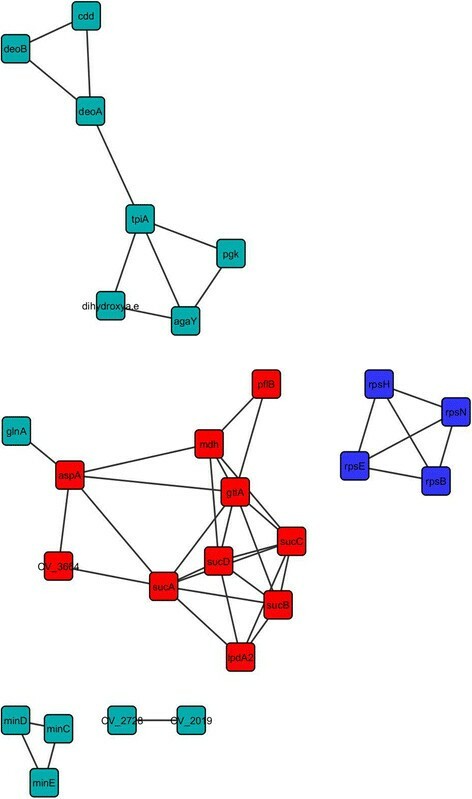 We created interaction networks from the proteomic data using the STITCH tool to look for proteins candidates coordinating the response of C. violaceum in response to the high concentration of iron. For this, proteins identified exclusively in the iron-responsive proteome and those found to be up-regulated served as input for the interactomes tools. Cystoscapes interactome analysis revealed a network comprised of 27 nodes and 44 edges (Figure4). The MCODE plug-in identified two main clusters in the network. The first (Red nodes in Figure4), corresponds to proteins belonging to energetic metabolism; the second is composed of ribosomal proteins (Blue nodes in Figure4). Indeed, these were two classes of proteins significantly abundant in our data; a possible role of these proteins in response to iron in C. violaceum will be discussed further. Protein interaction network of the iron-responsive proteome. The protein input was the data obtained from the proteomics analysis. Only the proteins that were up-regulated or exclusively identified in the iron responsive proteome were used in the construction of the protein-protein interaction network. The red and blue nodes represents the two clusters obtained with the MCODE plug-in, in which the red ones are the proteins related to energetic metabolism and the blue dots are ribosomal proteins. Finally, the centrality indexes provided by the CentisScape allowed the identification of the central nodes controlling the communication between the biological processes (Additional file 6). The nodes with high betweenness were the Fumarate Hidratase (AspA) and α-oxoglutarate dehydrogenase (SucA). This indicates the importance of the energetic metabolism in the iron-responsive proteome of C. violaceum. Possible roles for the proteins with unknown function from the iron-responsive proteome were investigated using BLAST and CDD (Conserved Domain Database). The identification of conserved domains may be the only clue to estimate the location and function of some proteins, as their domains have a high similarity with previously characterized proteins . Of the five hypothetical ORFs that were up-regulated in the presence of iron, we were unable to identify any conserved domain in two of them (CV_1472 and CV_3099). The ORF CV_4300 contains the USP-like functional domain that is related to stress defense. According to the CDD, the synthesis of proteins in the USP family is increased when the bacteria is exposed to stressful agents, increasing its survival rate during exposure to the agent. CV_0868 has a domain of unknown function (DUF1842). This protein was previously detected in C. violaceum in another proteomic work from our group that studied this bacterium when submitted to hydrogen peroxide (personal communication). Thus, we inferred this protein to be related to a stress response. The HHpred analysis showed that the primary structure of CV_0868 to be associated to the tertiary structure of a Cu-Zn Superoxide Dismutase from different organisms (Additional file 7). Analyzing the genomic context of CV_0868, we observed that this ORF is adjacent to two other ORFs, one encoding a putative SodB (CV_0867) and the other encoding a protein of unknown function (CV_0869). Thus, we hypothesized C. violaceum possess a yet non-described operon related to oxidative stress. To further investigate our assumption, we performed a RT-PCR of the possible new operon. The results showed the presence of an individual transcript comprising the three mentioned ORFs, leading us to suggest that this is, indeed, a new operon (Additional file 8). We further verified this hypothesis by Real Time PCR for the two ORFs comprising the operon (CV_0868 and CV_0869). The expression analysis (Additional file 9) of these two genes showed that after four hours of treatment, an up-regulation of these ORFs could be observed and therefore strongly suggests these proteins to be a response of C. violaceum to the iron treatment. Energetic Metabolism describes one of the most expressive groups containing up-regulated or exclusively identified proteins in the presence of iron (Table1 and Additional file 4). Many enzymes from this metabolic pathway have an Fe-S cluster in its active center, which helps to explain the metabolic exchange to pathways in which enzymes do not use iron in their catalytic core. Supporting our results, Nwugo et al. observed a boost in the expression of TCA cycle related proteins when exposing Acinetobacter baumannii to an iron rich medium. 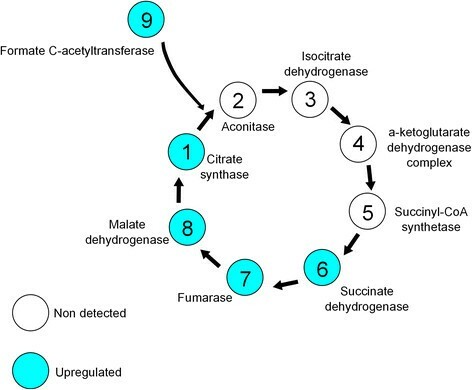 Four proteins that were up-regulated after the iron treatment belong to the tricarboxylic acid cycle (SucB, AspA, GtlA, and Mdh). Moreover, the protein Formate c-acetyltransferase (PflB) was up-regulated in the experimental condition. This protein is not known to be directly related to the tricarboxylic acid cycle but could be indirectly playing a role through an anaplerotic pathway. Figure5 summarizes the energetic metabolism of C. violaceum in response to the high concentration of iron used in the culture. Integration of energetic metabolism in C. violaceum . The up-regulation of enzymes with iron in its catalytic center is leading to a boost of the TCA. The relationship between iron and oxidative stress is well established. Although iron cannot directly damage biomolecules, it enables the Fenton Reaction, leading to the production of Reactive Oxygen Species (ROS), which harms molecules such as DNA and proteins . The total protein extract from C. violaceum was submitted to TAA assay and we observed an increase in the antioxidant activity in the protein extract from the iron treatment (Figure2C). Additionally, the activity of the antioxidant enzymes Kat and Sod was also increased when the bacterium was cultured in the presence of the metal (Figure2A and B). Although these assays showed the generation of oxidative stress in the experimental condition, we were unable to detect these enzymes in our mass spectrometry analysis. In fact, we observed the down-regulation of many enzymes clearly related to antioxidant defense (DnaK, HtpG, Dps, and Thioredoxin) (Table1). Nonetheless, the down-regulation of these enzymes is not necessarily correlated to a decrease in their activities. On the other side, two Glutathione S-transferase proteins were up-regulated in our iron-responsive proteome which suggests that the iron treatment induced an oxidative stress in C. violaceum. Two other proteins that were up-regulated in the iron treatment were a Phasin and an outer membrane protein (OmpW). The former is a granule-associated protein that affects the synthesis and accumulation of Polyhydroxyalkanoates (PHAs) . These polymers contribute to the redox balance and are known to be accumulated when the organism is subject to unfavorable conditions . Thus, to compensate the down-regulation of the usual stress-related proteins, C. violaceum might be enhancing the expression of PHAs synthesis-related proteins as Phasin. OmpW is a porin widely distributed among Gram-negative bacteria and is associated to stress resistance . For example, Gil et al. showed that OmpW becomes up-regulated when Salmonella enterica is submitted to Paraquat, a generator of superoxide, promoting the efflux of this ROS. The superoxide anion is yielded as a by-product of electron transporter chain and is a harmful reactive oxygen species. In this way, C. violaceum may be up-regulating the synthesis of OmpW to counteract the harmful effects of superoxide, as the main antagonist enzyme of this component (Superoxide dismutase) was not detected in our work. General metabolism proteins (replication, translation, cell cycle) were the proteins most abundantly detected in this study, especially between those that were down-regulated in the presence of iron. Indeed, in other proteomics studies, ribosomal proteins, proteins related to the biomolecules synthesis, such as tRNAs, have the greatest representations -. As one can note from Additional file 2, the iron is inducing a growth arrest in C. violaceum. The fact that many proteins from general metabolism were down-regulated in the iron responsive proteome could explain this growth halt. The bottlenecks from the protein-protein interaction network are key nodes as they represent proteins that connect various functional clusters . Yu and colleagues  provide an interesting discussion on importance of the bottleneck proteins in the maintenance of biological systems and that the deletion of some of these proteins may lead to a disruption of signal cascades, and ultimately to cell death. The protein-protein interaction study pinpointed two proteins with high degree of betweenness and node degree inside the iron-responsive network; the AspA and SucA. Both proteins are part of the energetic metabolism, more specifically the Tricarboxylic Acid Cycle, suggesting that the great connectivity between these proteins with the whole iron-responsive network is part of the response of C. violaceum to the treatment. 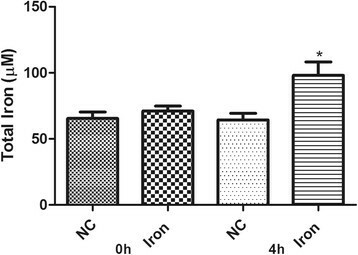 The importance of the energetic metabolism to adaptation of many microorganisms in the presence (and absence) of iron has been well established in previous works ,. Our data suggests the identification of a new operon that encompasses the ORFs CV_0867, CV_0868, and CV_0869. The RT-PCR results indicated that all three genes are transcribed as a single transcript. We hypothesize that this operon could be related to oxidative stress mainly because our HHPred analysis indicated CV_0868 as being a Superoxide Dismutase (Sod). Moreover, CV_0868 was up-regulated in the iron-responsive proteome. Further functional characterization experimentation is required to confirm if the protein CV_0868 is a Superoxide Dismutase. This is the first proteome study of Chromobacterium violaceum in response to a high concentration of iron. The analysis reveals the importance of energetic metabolism and stress proteins to the adaptation of the bacterium to the iron-repleted environment. Most importantly, we identified a new operon, encompassing the ORFs CV_0867, CV_0868 and CV_0869, that is probably related to oxidative stress response. Our data analysis supports the hypothetical protein CV_0868 as a Type C Superoxide Dismutase (SodC). Biochemical studies in our laboratory are being carried out to confirm the dismutation capacity of this protein. The other proteins with unknown function are good candidates to have their role determined in the involvement of iron homeostasis. All the .raw, .sqt and .sepr files from this work are available for download at http://proteomics.fiocruz.br/dchaves/2014-1. DCL contributed to the design, conduct and analyses of experiments, and the writing and preparation of the manuscript. FTD contributed to experiment design, data interpretation and manuscript revision. VKSM contributed to experiment design, data interpretation and manuscript revision. DBL participated in the proteomic data interpretation. PC participated in the proteomic data interpretation and manuscript elaboration. DB was involved the protein-protein network analysis. SRB contributed to the study conception and design, writing of the manuscript and overall supervision. All authors read and approved the final manuscript. We thank the Laboratory of Mass Spectrometry of the Biosciences National Laboratory, CNPEM-ABTLuS, Campinas, SP, for the assistance in mass spectrometry data acquisition. We also thank Jana Dara Freires de Queiroz for her help with the antioxidant analysis. This work had financial support from CNPq, INEspao, Fiocruz PDTIS, FAPERJ, and CAPES. This article is published under license to BioMed Central Ltd. This is an Open Access article distributed under the terms of the Creative Commons Attribution License (http://creationcommons.org/licenses/by/4.0), which permits unrestricted use, distribution, and reproduction in any medium, provided the original work is properly credited. The Creative Commons Public Domain Dedication waiver (http://creationcommons.org/publicdomain/zero/1.0/) applies to the data made available in this article, unless otherwise stated.